Discover the most beautiful dance in the world! You don’t need to be a certain size, shape or age. Everyone is welcome to join in the fun! 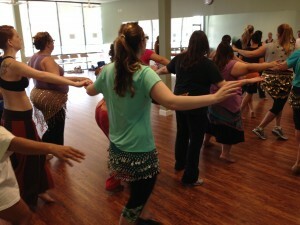 Belly Dance classes are one of the best low impact, total body workouts available. When done 2-3 times a week, belly dancing burns calories, tones your entire core, strengthens every major muscle group, increases flexibility, and improves stamina. Dance does wonders for your disposition. Life can be crazy, but we can take a moment to do something good for ourselves, like MOVE. Numerous studies have shown the mental and emotional benefits of participation in regular dance and exercise classes. You will never leave a class feeling worse than when you came in. You will always leave feeling energized and invigorated. Belly dancing has a way of bringing bodies back into balance. Though learning to belly dance can be tough work, it’s very gentle on the body and safe for people of any age or people with current or prior injuries. Many experience relief from back and knee pain, digestion problems, menstrual cramping, headaches, …the list goes on. Learning to dance causes your brain to make new and different neural pathways. Stimulating your mind in new ways has been shown to keep your mind young and ward off diseases like Alzheimer’s and other dementia. Challenges, like learning choreography, helps to improve focus and memory. Belly dancing is one of the few dance forms where any size, shape, age, ethnicity are encouraged to participate. You don’t need a partner, though you can bring your friends along. You are never too small or large, too old, or too anything, to learn to belly dance. Check out our Class Schedule at Ahlam Academy of Middle Eastern Dance & Register NOW for TWO WEEKS of Unlimited Beginner and “Tech, Drills,& Zills” classes for $29. You can start anytime!